American entertainment has been rolling all over the world for decades. Now, another American phenomenon is rumbling and its popularity has crossed into other countries. It's monster trucks. "We're monster-trucking the world," said Kenneth Feld. He is in charge of Feld Entertainment. It's the company that owns the giant vehicles and the trademark Monster Jam events. "We're building the business globally. It's got a lot of traction." Monster Jam shows feature ginormous trucks. They race and are really loud. They crush old cars and leap into the air. The trucks have different themes. The black-and-neon green "Grave Digger" is probably the most popular. The "Zombie" is frightening. And the "Monster Mutt Rottweiler," a dog-themed truck, is actually kind of cute. The tires are often 66 inches tall and the trucks stand about 12 feet high. That's about the size of two grown men. 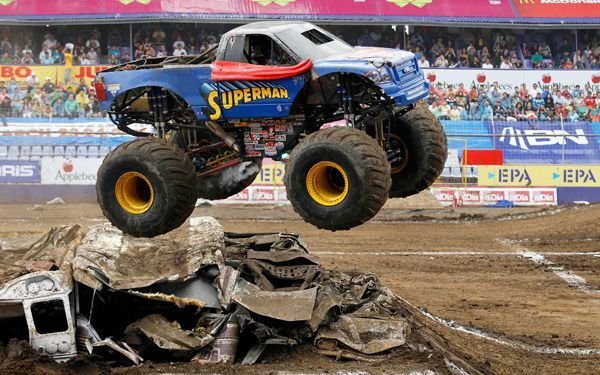 Monster Jam had its first international show in 2004. By 2012, it was featured in one large, international tour. In 2013, the company offered two international tours. In 2014, there were three. About 55,000 people packed one stadium in Sydney, Australia, in October. The trucks have visited in places around the world. Florida-based Feld Entertainment also owns the Ringling Bros. and Barnum & Bailey Circus. It bought the Monster Jam brand in 2008. In 2015, the company will embark on a 10-city Monster Jam tour in Brazil. It will have a three-city tour in Spain. There are plans for Asia and South America. The U.S. is where the sport started and where it's still very popular. "Absolutely everybody gets monster trucks. It is just big, loud and abusive." So says Tony Dixon, who drives a truck called "Swamp Thing." I think that it is COOL! How do they make the monsters trucks? I am going a event in March! It was an awesome monster truck on it ! I think that so many people like monster trucks but I really don't know why they like monster trucks because monster trucks are big humongous trucks that are no use and they like to run over things I think because in the picture the superman monster truck is running over some other white trucks which I am pretty sure its in a lot of trouble. I just want to know why people like monster trucks so much like a monster truck came in Moscow and fifteen thousand people came to see it while they could have been at home doing something more fun. This text talks about the monster trucks as entertainment and how it's got a lot of attraction, they've got a lot of fans all over the world, Feld entertainment, the owner of the Monster Jam brand has brought this show to many countries where it was very succesful. I think watching huge trucks crashing around is amazing haha I'd like to see them live someday I've only watched that show on TV. Feld entertainment owns the Ringling Bros. and Barnum & Bailey Circus too, and it's a very famous circus in the USA.